This shirt is similar to Sam’s Greyish-Greenish Silver-Snap Shirt, but this one has extra seams that run from the mid-breast pockets to the shoulders, and also down the back. It looks blue in bright light and green in dark lighting. It’s also got thick centre seams on the breast pockets. 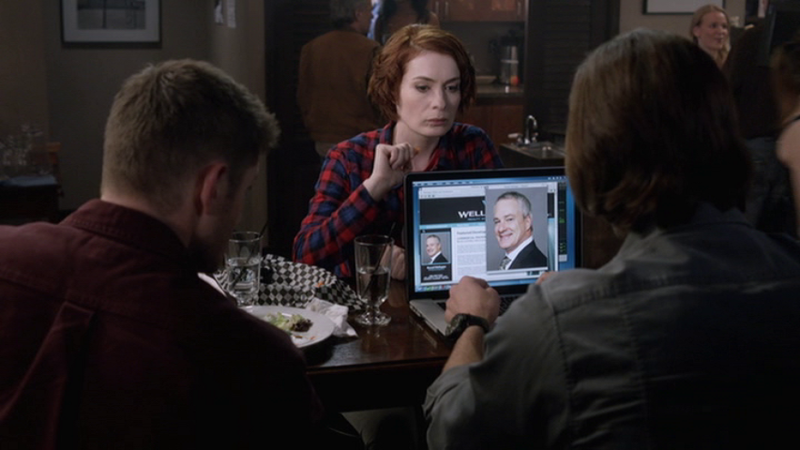 In There’s No Place Like Home (10x11), Sam wears this shirt when he and Dean are staking out the District Attorney’s house, waiting for Charlie to strike. He wears it until he and Good!Charlie leave to go back to the Bunker. In Inside Man (10x17), Sam wears this shirt from the morning after Dean’s nightmare until he and Cas deal with Metatron. He changes his shirt before he goes home at the end of the episode. In O Brother Where Art Thou (11x09), Sam wears this shirt from the beginning of the episode until they meet up with Crowley. He changes between meeting with Crowley and Crowley’s throne room where they recruiting Rowena. In All in the Family (11x21), Sam wears this shirt from when they’re discussing the plain with Metatron and Donatello in the bunker until the end of the episode. 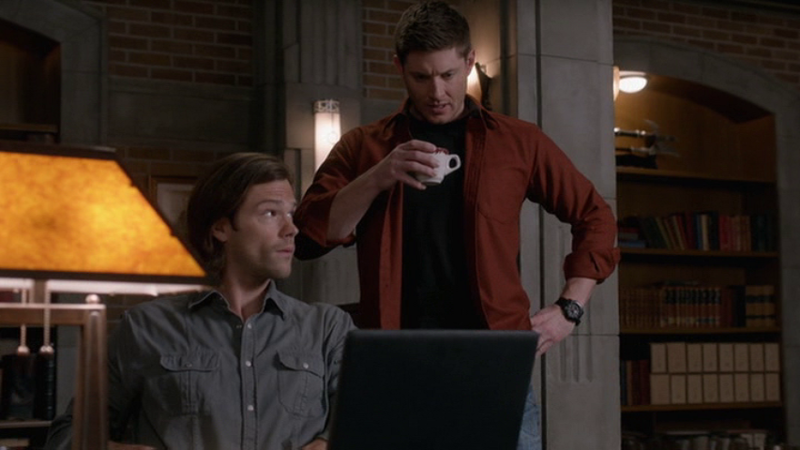 In We Happy Few (11x22), Sam continues to wear this shirt for the entire episode. 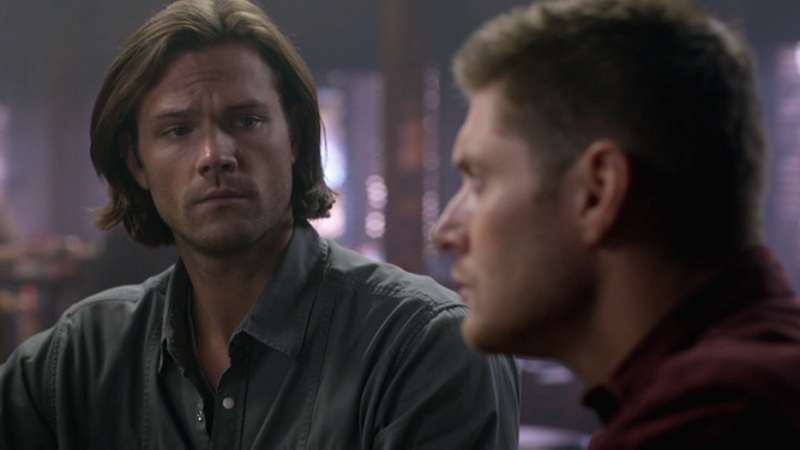 In Alpha and Omega (11x23), Sam continues to wear this shirt for the entire episode. In Keep Calm and Carry On (12x01), Sam continues to wear this shirt for the entire episode. In Mamma Mia (12x02), Sam continues to wear this shirt until he is rescued by Dean and Mary. I guess the grey goes better with the orange/red hue that Dean is wearing. It's a nice shirt. Yea, I really like this one.